First off, I wanted to let you know the winners of the nip buds from Thursday’s post. Did I say “winners,” plural? Yes I did, because I did not tell you, but I actually had two packages of nip buds! My human randomly drew the Island Cats and Anne to receive them! Concatulations to you! The Island Cats are also getting a pawtographed book plate from me because they reminded me that they had never received one for my first book, which they got from Max the Quilt Cat. Which gives me the opportunity to mention to the rest of you that if you buy one of my books, you can send me a self-addressed, stamped envelope and I will send a pawtographed book plate back to you — just send me a message and I will give you my mailing address. The contact link is at the top of this (and every) page. Except this month, you don’t even need to send me a SASE! I will pay the postage for all book plates until the end of June. So if you already have a book and don’t have a pawtographed book plate from me, let me know! Now let’s get onto the other topic today: the Petties. 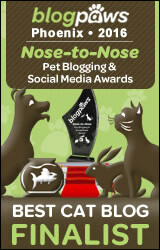 As many of you know, I won last year for Best Cat Blog. I was surprised and flattered to win because I thought the competition was pretty stiff — and I think it is even stiffer this year! According to the rules, last year’s winners are eligible to be nominated again this year. It would be pretty awesome if you nominated me again, but if you want to give another cat blog a chance, I think that’s pretty awesome too! In addition to Best Cat Blog, there are a couple of other categories that I could be nominated for… and that I think there are also other blogs that are equal to or better than mine: Funniest Blog or Blogger (I know some readers think I’m pretty funny, even though I am not funny 100% of the time, and I know at least three cat bloggers for sure who I think are funnier than me! ); and Best Designed Blog. My human is pushing for the latter because the description for the award reads, “A pet blog that stands out to you as being well designed and/or includes artwork or photography that makes visiting it a pleasure to the eyes,” and she works very hard on the photography for my blog (and has won some awards for her photos too!). Plus she designed the colors, modified the style sheet a lot and oversaw the layout for my blog. Oh, and there is one more category I actually would really like to be considered for: Best Blog Post. I looked through my past year’s blog posts and this one really stood out: Celebrating National Feral Cat Day — for Humans and Cats. This is personally one of my favorite posts I’ve written and it’s about a cause I am passionate about. I am really looking forward to see which of my pals become Petties finalists this year! My human voted by proxy from me for you Sparkle! I just send you a meow and some purrs from Istanbul, my internet connection is bad today, I think there is a seagull sitting on the line ! Concats to the Island Cats and Anne. I finks I need to gets your book or check if we has one already, we just might. I would luvs a book plate! I will has to lets you know. Momma…!! Hi Sparkle! I want to nominate you but the site asks for your email & I don’t see it? But my Human is kind of stupid so maybe she is just missing it? You are sooo right that the competition is extremely stiff this year……one thing I know for sure…..whoever wins will be totally worthy!!!! Congrats to the winners!! YAY!! Of course you know you always have our vote!!! Concats to the winners of the nip buds! OH Sparkle we are sure you will win! Good luck in the Petties, Sparkle! I’ll vote for you! WE purr for you in the contest. Sparkle, your bloggie is funny and well-designed, too! ConCatulations to the winners! We’ll go vote now! We will be visitin the Petties to see all the nominees. We are sure ta vote for you in some category! With your awesome pictures, I can totally see you winning best design! Congrats to the winners. We certainly think you should win for your feral post and I nominated you for sure for the Petties. That is so down my alley. We sure hope you win. Hooray for the winners! Hey, you’re the Pettiest kitty I know! Concatulations to the winners! We’ll do our part to vote in the Petties! We must go and vote! I already nominated you and I was quite put out that there was no goat category. Oh we shall have to go over there and help out. You know, if the Woman ever gets on track maybe I’ll be funny again. I hope you win again this year, Sparkle. Tell me when you’re nominated and I will vote. I’ve thought about being nominated for Funniest but know it’s a real longshot. Hope Island Cats enjoy the nip. 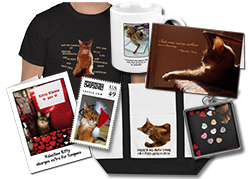 Concats to the winners….and includes you gorgeous Sparkle. Concats to the bud winners! Sparkle, you definitely have a great blog, good luck with the Petties. Mom told me that she saw you win last year and it was pawsome!!!!! Good luck again this year! We didn’t know about The Petties and we will check it out later! We certainly think you are a very deserving blogger, Sparkle! concats to the winners of the nip buds. What a very nice prize. We are so excited that we won the nip! We can’t wait to get it!! Sparkle, we think that post you did for Feral Cat Day really deserves to win. It was great. Concatulations to the Island Cats and Anne !!! Sparkle, You know I ask our friends to vote for me for Funniest Blog or Blogger. You know I didn’t think I’m that funny too. Who can be funny every day. That’s unreal. It might be some day I can make you laugh. But Other Categories even worse. I got no chance at all. I entry because I want my shelter to win. In Melbourne, Not much people help cats shelter but dogs’ one. I just want them to have a chance ( we didn’t have many product to help them like in USA. or Canada ) Because all I have to do, just ask friends to vote. They do for me or not. It’s up to them. But I don’t let the chance go. For me I want to vote for you for Best Cat Blog, Serious ! Mr. Puddy, your blog is hilarious!!! You are a serious contender for Funniest Blog category. Moreso than me. Anything we can do to help Sparkle – WE WILL!! !